Pedro Hernández, Acting Assistant Director for Facilities Development at the Miami-Dade Aviation Department, provides an overview of APMs at Miami. 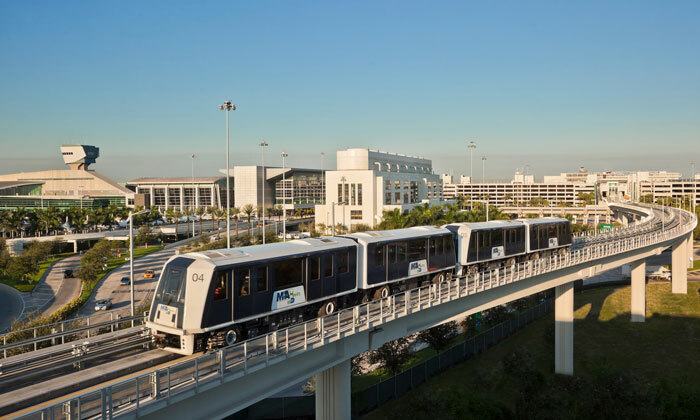 Within the last 10 years, Miami International Airport (MIA) has added and upgraded three new automated people mover (APM) systems to better meet the needs of its passengers who are connecting through the airport terminal. Pedro Hernández, Acting Assistant Director for Facilities Development at the Miami-Dade Aviation Department, provides an overview. One track of the dual-track APM that connects Concourse E with the Concourse E-Satellite facility was replaced and put into service in 2016, with the second track soon to follow in early 2017. The Concourse E-Satellite’s nine renovated gates serve both domestic and international flights, primarily for American Airlines. The $87 million contract by Beauchamp Construction Co. is upgrading the previous people mover system that was first constructed in the mid-1970s. The MIA Mover is a 1.25-mile-long APM system between MIA and the Miami Rental Car Centre, which opened to the public in 2011. It has the capacity to transport more than 3,000 passengers per hour free-of-charge directly between MIA and the Rental Car Centre’s customer service lobby just east of Le Jeune Road. MIA passengers are able to simply exit their concourse and take elevators to MIA’s third level moving walkway, which quickly connects them to the MIA Mover. The MIA Mover completely replaces the Rental Car Center shuttle bus service which was previously in operation; eliminating approximately 1,400 shuttle bus trips per day and reducing carbon emissions from MIA’s roadways by 30%. The MIA Mover’s MIA Station is also the first mass transit project in Miami-Dade County to be Leadership in Energy and Environmental Design (LEED) Gold-certified by the U.S. Green Building Council. The Rental Car Center, a 3.4-million-square-foot, four-level facility that houses 16 major rental car companies, was completed by the Florida Department of Transportation (FDFT) on July 2010 and serves an average of 16,000 airport customers daily. Under a design-build contract, Parsons-Odebrecht Joint Venture (POJV) constructed the MIA Mover guideway and stations and, through a subcontract with Mitsubishi Heavy Industries, installed the full turnkey operating system, including eight state-of-the-art Crystal Mover APM vehicles. Construction began in March 2009 and was completed within a budget of $270 million, with $170 million from the Miami-Dade Aviation Department’s Capital Improvement Program and $100 million from the FDOT. In September 2010, the Concourse D Skytrain people mover began whisking passengers between four conveniently located stations on the roof of the mile-long concourse. A ride-on the skytrain can take you from: station #1 near Gate D-17 at the easternmost end of Concourse D to station #2 for domestic baggage claim; continue to station #3 for connecting flights at gates D-26 to D-39, passport control or exit to Central or South Terminal; or carry you all the way to station #4 for gates D-40 to D-60 and American Eagle flights at the new Regional Commuter Facility — all within five minutes. Built by Parsons-Odebrecht with five four-car trains provided by Sumitomo Corporation of America and Mitsubishi Heavy Industries, skytrain has the capacity to transport 9,000 passengers per hour. It has also decreased walking time by 70% for domestic connecting passengers and 34% for international connecting travellers in Concourse D.
Pedro Hernandez is Acting Assistant Director for Facilities Development at the Miami-Dade Aviation Department. He oversees a team of 35 engineers, project managers and other professionals across six engineering, construction and technical support sections. Primary responsibilities include the planning, engineering and construction of new facilities including maintenance of the runways, taxiways apron pavements at MIA and the County’s four general aviation airports. In addition, Pedro has successfully overseen a $500 million capital improvement programme focused on mitigating MIA’s environmental impact. Under Pedro’s leadership, MIA obtained ISO 14001 Certification for Environmental Management Systems that cover critical aspects of airport operations.